The new Galaxy Book 2 Samsung’s latest attempt to nail the 2-in-1 device. The good news right up front is that Samsung has retained the a 12-inch Super AMOLED panel in the new device. More controversially, perhaps, Samsung has dumped Intel’s silicon for Qualcomm’s ARM-based Snapdragon 850 chipset. While we were fans of Samsung’s Galaxy Book 12 design from last year, that could be used on your lap with reasonable comfort thanks to the design of its keyboard cover that also doubled as a stand. This time around, Samsung clearly has fans of Microsoft’s Surface Pro 6 2-in-1 range in mind with a very similar design approach that combines a detachable keyboard with a kickstand built into the back of the tablet. Its 12-inch sAMOLED display has a resolution of 2160 x 1440 pixels (the same as last year), while its Snapdragon 850 (Quad 2.96GHz + Quad 1.7GHz) is paired with just 4GB of RAM. While this should be good enough for light Office-style productivity on the go, it’s a bit weak given Samsung packs a minimum of 6GB of RAM into its Galaxy Note 9 smartphone. Onboard storage is 128GB, although this is expandable via a microSD card. Battery life is rated at up to an excellent 20 hours. 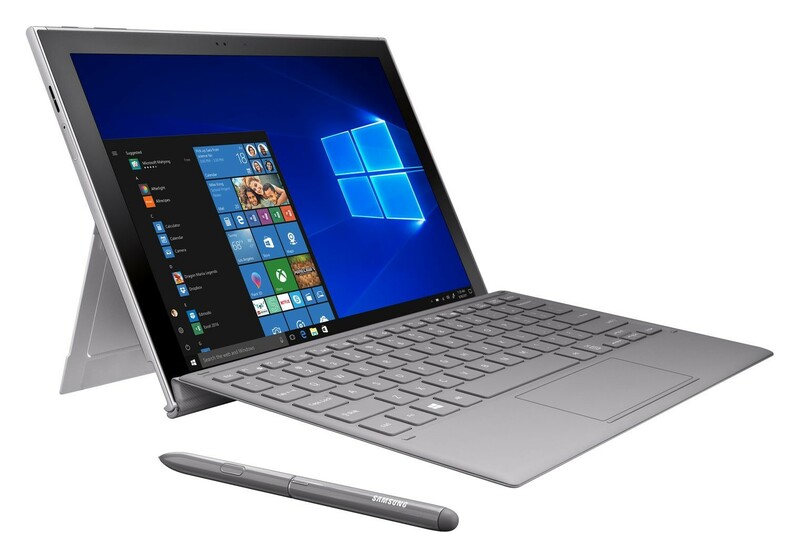 The Galaxy Book 2 also incorporates two USB-C ports and retains a 3.5mm headphone jack (a port that has started to disappear off tablets like the new Google Pixel Slate). Weight is just 1.75 pounds while it also, importantly, includes Gigabit LTE connectivity. There is an 8MP main camera and a 5MP front-facing camera included as well. Unlike the Surface Pro the keyboard is included, as is a Samsung S Pen. The feature list doesn’t stop there either. Like the recently released Galaxy Tab S4, the Galaxy Book 2 also incorporates speakers tuned by AKG with support for Dolby Atmos. The device ships with Windows 10 S Mode out of the box, although this can be upgraded. Perhaps even more impressively, Samsung has managed to keep the price down to US$999.99. It will be available in the US from November 2.